Author Caroline Stoessinger, right, befriended Holocaust survivor Alice Herz-Sommers. Editor's Note: Caroline Stoessinger, a concert pianist, is the author of "A Century of Wisdom: Lesson's From the Life of Alice Herz-Sommer, the World's Oldest Living Holocaust Survivor." 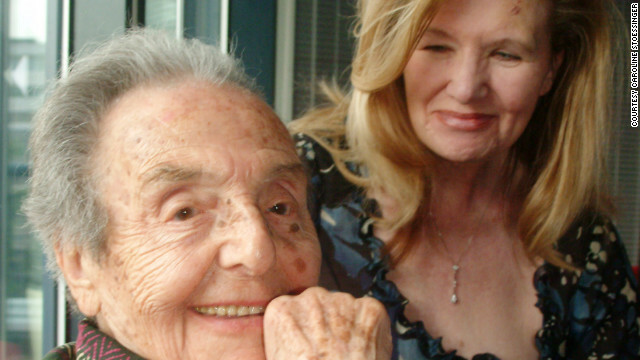 At age 108, Alice Herz-Sommers is the world's oldest survivor of the Holocaust. She was imprisoned at Theresienstadt, which was conceived by Hitler as a "model" concentration camp. Herz-Sommers - Alice, as I know her - is a pianist. In between summer 1943 and the camp's liberation at the end of the war, she played more than 100 concerts at Theresienstadt. Most were solo recitals culled from memory from her extensive repertoire. She has survived for more than a century with a profound faith in humanity intact and a smile on her face. As music is her kind of prayer, Alice still practices piano - Bach, Beethoven, Schubert – for three hours every day. Alice recognizes that anyone, anywhere, and at any time can adopt hatred and, worse, can infect others with its venom. Hatred that may begin with one person, like a single pebble cast into a lake, can spread out incrementally to larger and larger groups, and even to entire nations. "We are responsible for our actions and our words," she says. " And each of us must vigilantly guard against prejudice and hatred in our own minds and with the words that fall from our lips. No one is exempt. Hitler could not have come to power except in the climate of excessive hatred." Reinhard Heydrich, Hitler's "hangman," and his underlings understood that adding musical and artistic events to Theresienstadt could be a huge publicity stunt, to prove to the outside world that all was OK for the Jews. They ordered the prisoners to form a Freizeitgestaltung, or Free Time Committee, to organize concerts, lectures and other events. Crudely printed posters appeared to advertise the programs. Prisoners had no money so tickets were free. So many musicians had been sent to Theresienstadt that for a time before the members were shipped to their deaths in Auschwitz, four symphony orchestras could play there simultaneously. The artists took their performances just as seriously as if they were performing on the world stage. "As our situation became even more difficult, we tried even harder to reach for perfection, for the meaning in the music," Alice says. "Music was our way of remembering our inner selves, our values." was written in Theresienstadt, every concert played there, became a moral victory against the enemy. On Alice's third day in Theresienstadt, she was told to play a recital the following week. "But I need to practice," she responded. The next morning, Alice found the room where she had been assigned the 9:00 – 10:00 practice slot. With no time to waste, she began to work on her Chopin etudes only to find that the pedal did not work and that several keys stuck repeatedly. Refusing to be defeated, she quickly adapted to the piano's limitations and began to play with abandon, losing herself in the music. "At least I was making music and that always made me happy," she says. Despite the conditions in the camp and the inadequate, broken-down, legless instruments provided for concerts, emotionally she may have given her finest interpretations of Beethoven's and Schubert's sonatas in Theresienstadt. Despite the filth and hunger, Alice's routine life of working her obligatory factory job, performing, caring for her six-year-old son Rafi, and giving him and a few other children elementary piano lessons in spare moments helped her never to lose hope. "We were not heroic," Alice says. "We improvised. We managed to keep doing, keep working as usual. To not practice was unthinkable." In the camp Alice learned what she could live without. Rather than grieving for what she did not have, she rejoiced in what she had. Alice knew that no one could rob her of the treasures of her mind. "I am richer than the world's richest person because I have music in my heart and mind," she says today. While performing the prisoners could nearly forget their hunger and their surroundings. Besides the terror of finding their names on a deportation list for Auschwitz, the fear of dying of starvation, typhus, and other diseases had become a reality. "Music was our food, our religion and our hope," she says. "Music was life. We did not, could not, would not give up." 6. Complaining does not help. It makes everyone feel bad. Alice is anything but naïve and is acutely aware of the evil that has always been present in our world. "I know about the bad, but I look for the good," she says. 7. Faith is stronger than fear. lives on without the body." Alice finds consolation in her spiritual theme song, "Urlicht," with its opening words "I come from God and I will return to God." "Things are as they are supposed to be," she says. "I am still here, never too old so long as I breathe to wonder, to learn, and to teach." The opinions expressed in this commentary are solely those of Caroline Stoessinger. This is why any kind of racial legislation or regulation is wrong. Stop the Zionists from wrecking our world. All monotheistic religions teach hate, that's why they all have a convert or die approach to things. Probably too late to comment on this article, I just came across it – a year later – but still, what a wonderful and loving soul is Alice Herz-Sommers. I am appalled by the comments of hate, anti-semitism and Holocaust deniers on this blog. Where do these people come from? If only there were more Alice Sommers in the world, it would be a better place. Hi there, I found your website by means of Google even as looking for a comparable matter, your web site got here up, it appears to be like good. I've bookmarked to favourites|added to my bookmarks. Attractive part of content. I simply stumbled upon your weblog and in accession capital to claim that I get actually enjoyed account your blog posts. Anyway I'll be subscribing in your augment and even I achievement you get entry to constantly fast. Ridiculous. If Jesus believed in Judaism as these Jews claim, why did he found Christianity and has billions of followers? It means He saw something wrong with Jews hence he found the greatest religion on Earth. Actually..he wasn't the founder of Christianity. It would be more accurate to say that Paul, Peter, James and the other Apostles were the founders of Christianity. Jesus did not begin Christianity, The early followers of Jesus began Christianity. It is at the cross and because of the work of the cross, that we are reconciled back to God. He can once again look on us, through Jesus, and see us as holy and clean spiritually. There at the cross is where we are justified. "Just as if, we had never sinned". It was at the cross that the propitiation for our sin was offered up and paid the price, justice demanded in death/shed blood, and it is there that we are sanctified, and seen by God as cleansed, forgiven and holy through Jesus Christ. The Jewish people rejected Jesus as their Messiah, they rejected that He would come to die. They did not know He would establish His spiritual kingdom. Saul/Paul went about killing Christians, until one day Jesus as Lord made Himself known to Paul/Saul and he was the missionary to go to the Gentiles. The Gentiles were shown to be en grafted to this chosen linage, and shown that if they accepted Jesus' work at the cross, they too, would be accepted as "holy". (Peter's vision) The Jews rejected Him, so He then went to the Gentiles.............reject or accept..........that is the question.........we can see your answer. Arab Christian here. Jesus of Nazareth was Jewish: that is fact, not up for debate. His being the Christ doesn't change His heritage or religious upbringing. This is hands-down the most disgusting, most inaccurate and hateful thing I've ever heard out of a so-called Christian... or anyone else, now that I think of it. To post something so ugly in the comments section of an article about a Holocaust survivor is utterly inexcusable. Jesus was the first Christian he was not a practicing Jew and stood against everything the temple and it's priests stood for if you ever bothered to read the New testement? Jesus never claimed to be christian or a follower of the Jewish faith. He never claimed ANY religion. @Common Sense- No, Jesus didn't worship himself. He wasn't a Christian. He was a practicing Jew and celebrated the Jewish holidays. Not to mention he taught from the Tanakh at Temple and the Synogogues.